And the first wisdom, to be fool no more. 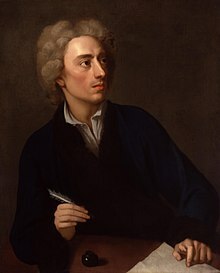 The Imitations of Horace were a collection of poems written by Alexander Pope from 1733 to 1738. They were written in the popular Augustan form of the "imitation" of a classical poet, not so much a translation of his works as an updating with contemporary references. Pope used the model of Horace to satirize life under George II of Great Britain, especially what he regarded as the widespread corruption tainting the country under Prime Minister Robert Walpole's influence and the poor quality of the court's artistic taste. Pope also added a wholly original poem, "An Epistle to Doctor Arbuthnot", as an introduction to the "Imitations". It reviews his own literary career and includes the famous portraits of Lord John Hervey, 2nd Baron Hervey ("Sporus") and Joseph Addison ("Atticus"). Tie up the knocker! say I'm sick, I'm dead. Who pens a stanza when he should engross? The world had wanted many an idle song. Obliged by hunger and request of friends. Destroy his fib, or sophistry — in vain! This long disease, my life. Line 169. Compare: "Whence we see spiders, flies, or ants entombed and preserved forever in amber, a more than royal tomb", Francis Bacon, Historia Vitæ et Mortis; Sylva Sylvarum, Cent. i. Exper. 100. Bear, like the Turk, no brother near the throne. Line 193. Compare: "Nor needs thy juster title the foul guilt / Of Eastern kings, who, to secure their reign, / Must have their brothers, sons, and kindred slain", John Denham,On Mr. John Fletcher's Works; "Poets are sultans, if they had their will; For every author would his brother kill", Roger Boyle, 1st Earl of Orrery, Prologues (republished in Dramatic Works, 1739). And sit attentive to his own applause. Line 199. Compare: "When needs he must, yet faintly then he praises; Somewhat the deed, much more the means he raises: So marreth what he makes, and praising most, dispraises", P. Fletcher, The Purple Island, canto vii. Pope also uses the reference, "While Cato gives his little senate laws" in his Prologue to Mr. Addison's Cato (1713), line 23.
Who would not weep, if Atticus were he? "On wings of winds came flying all abroad". Line 218. Compare: "And on the wings of all the winds / Came flying all abroad", Thomas Sternhold, A Metrical Version of Psalm civ. (To live and die is all I have to do)! Yet wit ne'er tastes, and beauty ne'er enjoys. Wit that can creep and pride that licks the dust. But stoop'd to truth, and moraliz'd his song. Line 340. Compare: "Fierce warres and faithful loves shall moralize my song", Edmund Spenser, Faerie Queene, Introduction, Stanza 1. No language, but the language of the heart. Lord Fanny spins a thousand such a day. Satire I, Book II, line 6. Satire I, Book II, line 69. And the sad burden of some merry song. Satire I, Book II, line 76. Bare the mean heart that lurks behind a star. Satire I, Book II, line 110. Satire I, Book II, line 127. Welcome the coming, speed the going guest. Satire II, Book II, line 159. This line is repeated in Pope's translation of the Odyssey, Book XV, line 83, with "parting" instead of "going". Of land set out to plant a wood. Satire VI, Book II, line 1. A crust of bread, and liberty. Satire VI, Book II, line 220. A patriot is a fool in ev'ry age. Epilogue to the Satires, Dialogue I, line 41. These you but anger, and you mend not those. Epilogue to the Satires, Dialogue I, line 53. Epilogue to the Satires, Dialogue I, line 136. At crimes that 'scape or triumph o'er the law. Epilogue to the Satires, Dialogue I, line 167. To Berkeley every virtue under heaven. Epilogue to the Satires, Dialogue II, line 73. Never gallop Pegasus to death. Epistle I, Book I, line 14. Epistle I, Book I, line 38. Epistle I, Book I, line 53. Here, Wisdom calls: "Seek Virtue first, be bold! As Gold to Silver, Virtue is to Gold." Epistle I, Book I, line 77. Epistle I, Book I, line 94. Epistle I, Book I, line 103. Compare: "Get money; still get money, boy, No matter by what means", Ben Jonson, Every Man in his Humour, Act ii, Scene 3. Epistle I, Book II, line 26. Compare: "Above any Greek or Roman name", John Dryden, Upon the Death of Lord Hasting, line 76. It is the rust we value, not the gold. Epistle I, Book II, line 35. It is, and is not, the voice of God. Epistle I, Book II, line 89. Epistle I, Book II, line 108. In the dry desert of a thousand lines. Epistle I, Book II, line 111. And yielding, soft metal flow'd to human form. Epistle I, Book II, line 147. Compare: "The canvas glow'd beyond ev'n Nature warm; The pregnant quarry teem'd with human form", Oliver Goldsmith, The Traveller, line 137.
Who says in verse what others say in prose. Epistle I, Book II, line 202. Epistle I, Book II, line 205. Epistle I, Book II, line 267. The last and greatest art — the art to blot. Epistle I, Book II, line 280. Epistle I, Book II, line 300. Compare: "A breath can make them as a breath has made", Oliver Goldsmith, The Deserted Village, line 54. Epistle I, Book II, line 304. Compare: "Many-headed multitude", Philip Sidney, Defence of Poesy, Book ii. To sing, or cease to sing, we never know. Epistle I, Book II, line 358. Praise undeserv'd is scandal in disguise. Epistle I, Book II, line 413. This line is from a poem entitled "To the Celebrated Beauties of the British Court", given in Bell's "Fugitive Poetry", vol. III. p. 118. Compare the following epigram from "The Grove", London, 1721: "When one good line did much my wonder raise, / In Br—st's work, I stood resolved to praise, / And had, but that the modest author cries, / 'Praise undeserved is scandal in disguise'". On a certain line of Mr. Br——, Author of a Copy of Verses called the British Beauties. Epistle II, Book II, line 72. Epistle II, Book II, line 85. Words that wise Bacon or brave Raleigh spoke. Epistle II, Book II, line 168. It gives men happiness, or leaves them ease. Epistle II, Book II, line 182. Epistle II, Book II, lines 322-327. Epistle VI, Book I, line 27. So known, so honour'd at the House of Lords. Epistle VI. Book I. To. Mr. Murray. Compare: "Persuasion tips his tongue whene'er he talks, And he has chambers in King's Bench walks", Colley Cibber, parodying Pope's lines. The Imitations of Horace seem to have been written as relaxations of his [Pope's] genius. This employment became his favourite by its facility; the plan was ready to his hand, and nothing was required but to accommodate as he could the sentiments of an old author to recent facts or familiar images; but what is easy is seldom excellent: such imitations cannot give pleasure to common readers. The man of learning may be sometimes surprised and delighted by an unexpected parallel; but the comparison requires knowledge of the original, which will likewise often detect strained applications. Between Roman images and English manners there will be an irreconcileable dissimilitude, and the work will be generally uncouth and party-coloured; neither original nor translated, neither ancient nor modern.